Henry Ling Roth : Rafts, Canoes and Swimming, Tasmania, 1899. Roth, Henry Ling : Navigation. F. King & Sons, England, 1899. In a detailed paper, Roth examines and analyses all the sources available to him pertinent to rafts, canoes and swimming of the Tasmanian Aboriginals. Note that while Roth illustrates the three models of Tasmanian "canoes" in the Pitt Rivers Museum, Oxford, (page 156), he does not discuss these in the text. Confusingly, he does discuss three small models of canoes made by aborigines in the Hobart Museum. The lower craft, a simple unitary bundle of reeds, is far more likely to be a type of float board, paddled by hand. Unfortunately, in the online edition, the in-text illustration on page 156 is incomplete, and the plates and the Bibliography are not reproduced. The relevant plate (facing page 153) and the full illustration are reproduced here from the book, and the relevant sources from the Bibliography are footnoted, with some adjustment. 19 p.,  leaves of plates : ill. ; 24 cm. Caption title. "From Records of the Australian Museum, Vol.viii, no.1." - Cover. Call Number: N 507 AUS v. 8. South Melbourne : Macmillan Education Australia, - Barlow, Alex. Aboriginal technology. Papers & Proceedings of the Royal Society of Tasmania 1938, Hobart, 1939, pages 221-5, 3 figures. Plate: Canoe [and Baskets (bags), not shown]. or as a result of its packaging in its despatch from Australia, or when displayed as an exhibit. When at [corrected in errata] Hummock Island[,] Flinders (Sec. iv. p. 171) was much puzzled to know how the Tasmanians got there, for he was certain the natives at Port Dalrymple had "no canoes nor any means of reaching islands lying not more than two cable lengths from the shore," and the island in question was incapable of supporting permanent subsistence. It would also seem certain that the aboriginals visited the Maatsuyker Islands on the stormy south coast, the nearest of which is three miles from the mainland, for Flinders noticed that the scrub and grass land had been burnt (I. Intro, p. clxxx). Kelly found they visited Hunter's Island, north of Cape Grim. He met with no canoes anywhere (Collins pp. 169, 180, 188), nor did he see any trees so barked as to indicate canoe making, yet he found that the De Witt Isles, and, in fact, all the islands in Frederick-Henry Bay, had evidently been visited. Neither did Furneaux nor Cook meet with boat or canoe or any vessel to go upon the water. Nevertheless the natives did contrive constructions which served them in their navigations. are only fit for crossing the water when the sea is very tranquil ; otherwise they would soon be broken asunder by the force of the waves." "It was made of the bark of trees; in shape nearly resembling that which is represented in the plate [in his book] , being as broad, but not so long by more than a third. The pieces of bark that composed it were of the same structure as that of the Eucalyptus resinifera, but its leaves were much thinner. These pieces had been held together by cords, made of the leaves of grasses, forming a texture of very large meshes, most of which had the form of a pretty regular pentagon." "On the shore of our little bay we found some sort of canoes (pirogues) seven to nine feet long, equally flat above and below. Their width was from three to four feet in the middle, diminishing to each of their two extremities, which ended in a point. They were made of very thick bark of trees, joined parallelly, and fastened together with reeds, or other fibrous grasses. They were, indeed, but very small rafts, to which had been given the form of a canoe." Peron (ch. xii. p. 225) speaks of the canoe being "formed of three rows of bark roughly joined together and held by thongs of the same nature" (i.e. not of grass). The drawing he gives is almost identical with La Billardiere's. "Three rolls of Eucalyptus bark formed the body. The principal roll or piece was 4m. 55cm. (14ft. 11in.) long by 1m. (3ft. 3in.) broad, the two other pieces being only 3m. 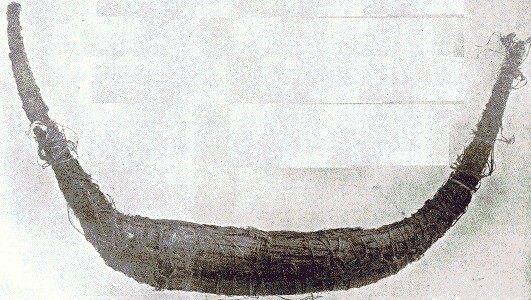 90cm. (12ft. 9in.) long by 32cm. (12 1/2in.) broad. These three bundles, which bore a fair resemblance to a ship's yards, were fastened together at their ends ; this made them taper and formed the whole of the canoe. The scarfing was made fairly compact by means of a sort of grass or reed. So completed the craft had the following dimensions: length inside, 2m. 95cm. (9ft. 8in.) ; outside breadth, 89cm. 2ft. 11in. ); height, 65cm. (1ft. 3 1/2in.) ; depth inside, 22cm. (8 1/2in.) ; thickness at the ends, 27cm. (10 1/2in.). Five or six savages can get into these canoes, but generally the number is limited to three or four at a time. Their paddles are simple sticks from 2.50 metres (8ft. 1in.) to 4 and 5 metres (13ft. and 16ft. 3in.) long, by 2 to 5 centimetres (1in. to 2in.) thick. Occasionally when the water is shallow they make use of these sticks to propel themselves as we do with poles. Generally they sit down when working their canoes and make use of a bundle of grass as a seat ; at other times they keep standing. We saw them crossing the channel [d'Entrecasteaux] only in fine weather ; it is quite conceivable that such frail and imperfedl vessels could not make progress or even maintain themselves in a rough sea. It seems also they have never tried to make longer journeys than to navigate from one promontory to another, or to cross a bay or port in the channel. They always place a fire at one end of their canoes, and in order to prevent the fire from spreading they place underneath it a sufficiently thick bed of earth or cinders." (Peron's Voyage redige par Freycinet, Paris, 1815, pp. 44-45). "Mr. Roberts, formerly of the Bruni Saltworks, described to me the mode of constructing catamarans in the channel. Corrijong bark string, and were strong enough not only to carry men across that stormy sea, but even on the Southern Ocean to De Witt and other islands, which were visited by the natives on sealing excursions. The head and stern were raised high above the water like horns. Each boat would hold from four to six men. Long sticks, or spears, or bark paddles, plied first on one side, then on the other, supplied the place of oars, and propelled this rude contrivance as quickly as an English whaleboat. At each stroke the rowers uttered a loud 'Ugh,' like a London pavior. The boats have been known to survive in very rough seas. An old whaler told me he had seen one of them go across to Witch Island, near Port Davey, in the midst of a storm. No catamarans were used on the northern side of Tasmania." Aborigines to "cross to Maria Island and islets in the vincinity of the mainland." Brought from Australia, in 1843, by Sir John Franklin and presented to Eton College. In the Hobart Museum there are three small models of canoes made by aborigines. Each of the three is made of three bundles of bark- thick in the middle and tapering to each end, like a Tenerlffe Cigar. One of these cigar-shaped bundles forms the floor or keel ; another bundle of similar shape and size is on each side of the keel and raised above it, to form the sides. The three bundles are firmly bound together with coarse tough grass fibre, partly knotted, forming a sort of rough open network, very irregular. The bow and stern are finished off with thin projecting rolls of bark, bound to the main part with a tough grass, tightly served round them (See Peron Col'd. Plate xiv). In the largest model, the two side rolls or bundles (which are slightly curved on the floor piece) measure 21 in. ; the beam measurement is 6 inches; stem and stern project 6 inches and 13 inches respectively from the body of the canoe. I cannot say which is the stem, and which is the stem. This grass is very tough and course, and resembles the "cutting grass," (Cladium Psittacorum. Nat, Ord, Cypetaceae), but is smooth, without the cutting edge of that plant. The smallest model is evidently very much older than the others. It measures 23 inches in length over all, and has very little projecting stem or stern (like the largest figure in Peron*s Col'd Plate). It is formed of three bundles of the velvety bark of the paper-barked tea tree (Leptospermum), and is bound together with a network of fibre, partly knotted, in the same manner as the others. But in this model the fibre is not of grass, but of strips of the bark of a shrub — probably "Currijong" (Plagianikus Sidoides). The model canoe in the British Museum [see page 153, above] was obtained from Dr. Milligan, in 1851, and is made of three bundles of bark of leptospermum and melaleuca roughly bound together by an extremely crude sort of network of partially twisted grass, the grass being merely wound round the bark and partly knotted. Length, 2 feet 6 inches. "They were formed of many little bundles of gum-tree bark, tied with grass, first separately, and then bound together in the required form, thick and flat, without any attempt at the shape of a boat or canoe, and not keeping the passenger above water when used, but just serving to float him on the surface. In, or rather on, these, the natives sat and paddled about with long sticks, or drifted before the wind and tide ; and in calm weather frequently crossed over from the mainland to Maria Island ; on such occasions they provided a little raised platform on the raft, on which they carried some lighted fuel to kindle their fire when they arrived there." Robinson, who, according to Calder, called this raft a machine, said it was only used by the natives of the south and west coasts. He describes it as "of considerable size, and something like a whale-boat, that is, sharp sterned, but a solid strucflure, and the natives in their aquatic adventures sat on the top. It was generally made of the buoyant and soft velvety bark of the swamp tea-tree (Melaleuca sp. ), and consisted of a multitude of small strips bound together. . . . Common sticks, with points instead of blades, were all that were used to urge it with its living freight through the water, and yet I am assured that its progress was not so very slow. My informant, Alexander M'Kay, told me they were good weather judges, and only used this vessel when well assured there would be little wind and no danger, for an upset would have been risky to some of the men, who . . . were not always good swimmers " (Calder, J. A. I. pp. 22-23). In Knopwood's Diary (21st June, 1804), describing the visit of Collins to the Huon river, we read that three of the natives in "cathemarans or small boats made of bark that will hold about six of them." Bonwick reproduces (p. 50) an account given him by a convict, in which it is stated that a handled axe was used in order to get sheets of bark off the tree, out of which a real canoe was made. G. W. Walker (MS. Jour. 5, Dec. 1832) mentions that at the Arthur River, a large and deep river, when Cottrel was trying to induce a tribe to surrender, a Sydney native made a rude canoe of bark to cross the river. According to Dove (I. p. 251), a species of bark or decayed wood, whose specific gravity appears to be similar to that of cork, provided them with the means of constructing canoes. The beams or logs were fastened together by the help of rushes or thongs of skin. This sounds something like Jeffreys' account. "Their canoes have been very inaccurately described, but in fact, they do not appear to have very frequent use for these vessels, as they but seldom visit the coast. . . . When, however, . . . they come to . . . the sea, a large river, or a lake, they make canoes from the adjoining woods. These, when formed, are not unlike a catamaran, and are sufficiently large to support from six to ten persons in crossing the largest rivers. These canoes are formed by the trunks of two trees about thirty feet long, and laid in a parallel direcfiion, at a distance of five or six feet from each other, and are kept in that position by four or five lesser pieces of wood, fastened at each end by slips of tough bark. In the middle is a cross timber of considerable thickness, and the whole interwoven with a kind of wicker-work. This flat and completely open canoe, or rather float, is made to skim along the surface of the water, by means of paddles, with amazing rapidity and safety. The natives are frequently seen on them near the southern mouth of the Derwent, between Isle Brune and the main, when the canoes are often found deserted, after they have answered the immediate purpose for which they were constructed " (pp. 126-128). But Dove's account appears to be made up out of two accounts, one as to making the vessels out of bundles of bark, and one as to the making out of logs. It seems to be probable that the aborigines made use of logs in crossing rivers and narrow straits, and may occasionally have fastened two together. The Eucalyptus wood is too heavy to float, and few Tasmanian woods have sufficient buoyancy to serve for rafts unless very dry. In any case, Jeffrey's wicker-work must be a touch of imagination, or very superficial examination as at a distance the illustration might possibly give the impression of wicker-work to a careless observer, and the speed he speaks of is extremely doubtful. "I never heard of a canoe. We were told by our elders that the aborigines got dry Oyster Bay Pine logs each, and a leafy branch, and when the wind favoured, crossed thus the Schotten Passage to Schouten Island, and also to Maria Island. I always heard that in crossing a river the aborigines used a bundle of bark, or a suitable log if procurable." Ratzel's statement (Valkerkunde, 2nd Germ. Ed. I. p. 352) that the aborigines had small canoes made of "outspread skins (Kleine Kahne aus ausgespannten Fellen)" is unsupported by any authority. "Lieut. Gunn found and preserved for several months, a catamaran, sufficiently tight and strong to drift for sixteen or twenty miles: each would convey from four to seven persons ; " . . . and that " Taw, the pilot of Macquarie Harbour, saw the natives cross the river ; on this occasion a man swam on either side of the raft, formed of the bark of the "swamp tree." of propulsion is also recorded by Backhouse when speaking of the rafts (p. 58) : " On these, three or four persons are placed, and one swims on each side, holding it with one hand." We have just seen above that in the use of their floats a native swims on each side, holding the float with one hand, and under the heading fishing we have read of some of their powers of swimming and diving. Calder and Kelly [adjusted in errata] says (J.A.I, p. 23): "Some of the men, unlike the women, were not always good swimmers, though most of them were perfect." La Billardiere "wishing to know whether these islanders were expert swimmers, one of our officers jumped into the water, and dived several times ; but it was in vain that he invited them to follow his example. They were very good divers, however, . . . for it is by diving that they procure a considerable part of their food" (II. ch. X. pp. 51-52). "Hitherto we had but a faint idea of the pains the women rake to procure the food. . . . They took each a basket, and were followed by their daughters, who did the same. Getting on the rocks that projected into the sea, they plunged them to the bottom in search of shell-fish. When they had been down some time, we became very uneasy on their account. ... At length, however, they appeared, and convinced us they were capable of remaining under water twice as long as our ablest divers. An instant was sufficient for them to take breath, and then they dived again. This they did repeatedly till their baskets were nearly full " (II. ch. x. p. 57). In Banks Straits Kelly (p. 13) records the old chief, Tolobunganah swimming out to his boat. Backhouse mentions that "two white men being in danger of drowning on a raft, some of the native women . . . swam to the raft, and begged the men to get upon their backs, and they would convey them to the shore ; but the poor men refused, being overcome with fear " (p. 147) ; and on another occasion that " two women waded and swam from Green Island to the settlement - a distance of three miles" (p. 8g). Meredith mentions that "a native woman, to avoid being captured, rushed into the sea, where she swam and dived for some time, before she could be induced to come ashore" (p. 205). Davies speaks of the women "being generally, if not at all times, the divers" (p. 413). With the exception therefore of Calder, no writer speaks of the men as swimmers. As related above Lloyd saw a party of aboriginals in the water spearing sting-ray tor sport. Ross, in "Hobart Town Almanack, 1836 " (p. 146), describes a mob of blacks, about sixty in number, cooking and feasting from 9 a.m. to 4 p.m., " when they all of a sudden, naked as they were, rushed into the broadest and deepest part of the river, in front of my cottage, and splashed and gambolled about for at least an hour." The river was the Shannon, one of the northern tributaries of the Derwent, and the tribe was the Big River tribe. Flinders, Matthew: Voyage to Terra Australis, . . . prosecuted in the years 1801-3, in the Investigator, the Porpoise, and the Cumberland. 2 vols. 4to and folio Atlas. London, 1814. Colonies and Slaves, House of Commons Papers. Session 14th June to 20th October, 1831. Vol. xix. Fol. [London]. Contains, No. 259, V. D. Land, 23rd September, 1831 : " Copies of all Correspondence between Lieut. Gov. Arthur and H. M. Secretary of State for the Colonies, on the subject of Military Operations lately carried on against the Aboriginal Inhabi­tants of V. D. Land." It includes a Report of a Committee which sat on the Aboriginal Question at Hobart, the minutes of the Executive Council relating to the Aborigines, and the evidence amongst others of Messrs. Bedford, Brodribb, Burnett, E'spie, Hobbs, Kelly, Knopwood and, O'Connor. This portion appears to be a reprint by the Colonial Office, London, of the Report published in Hobart in 1831, entitled, " Correspondence ... on the subjeft of the Military Operations lately carried on against the Aboriginal Inhabi­tants of V. D. Land." Collins, David. An Account of the English Colony in New South Wales, 2 vols. 4to- London, 1798-1802. In Vol, ii. is an abridged account of the discovery of the Straits, taken from Bass' own Journal. The information about the Tasmanian Aborigines, is very meagre. "He leaves the description of the Tasmanians to be given by his friend, Bass." It would therefore seem that Collins must have considerably abridged Bass' account. On the other hand, as Collins enters so fully into the details of the life of the Australian aborigines, it is not likely he would have left out any important information about the Tasmanians, had Bass give such in his journal, ii. pp. 167 and 187. Cook, Jas. Capt. : [Second Voyage] Voyage toward the South Pole and round the World, in H.M.S Resolution and Adventure, in the years 1772-1775. 2 vols. 40. London, 1777. Vol. I. pp. 113-115, contains Capt. Furneaux's observations on huts and implements. Cook, Jas. Capt. : [Third Voyage] Voyage to the Pacific Ocean in H.M.S. Resolution and Discovery, in the years 1776-1780. 3 vols. 40. London, 1785. [First edition 1784]. Vol. I, pp. 06-103. Cook's observations. Dr. Anderson's account of the Tasmanians. Ibid pp. 111-11.7. La Billardiere, Jacques Julien de: An Account of a Voyage in Search of La Perouse in the years 1791, 1792, 1793. 2 vols. 8vo. Plates 4to. London, 1800. This expedition paid two lengthened visits to Tasmania under the command of Bruny D'Entrecasteaux, in the ships Recherche and Esperance. Rossel, E. P. E. de: Voyage D'Entrecasteaux, 2 vols, 4-to. Paris,1808. This is another account of the. expedition described by La Billardiere. Peron, Francois, and Freycinet, Louis: Voyage de Decouvertes aux Terres Australes. ... le Geographe, le Naturaliste, et le Casuarina. 2 vols, and atlas, 4to., Paris, 1807-1816*, and atlas of Maps, 1812. The first Vol. is by Peron, 1807, the 2nd was edited by Freycinet after Peron's death (1816). 2nd ed. 4 vols. 8vo. and Atlas 4-to, Paris, 1824. These volumes .contain a complete account of the voyager's transactions in Tasmania; the atlases contain coloured portraits of the Tasmanian Aborigines, drawings of their implements, canoes, &c.
Bonwick, Jas. : The Last of the Tasmanians. 8vo. pp. viii. + 406. London, 1870. - Daily Life and Origin of the Tasmanians. Svo. pp. x. + 304. - The Lost Tasmanian Race. 121110. pp. vi. + 216. London, 1884. Meredith, Charles, Mrs. My Home in Tasmania during a Residence of Nine Years. 2 vols. i2mo. London, 1852. Calder, James Erskine. : Some Account of the Wars, Extirpation Habits, &c. of the Native Tribes of Tasmania. i2mo. pp. 114 + iii. Hobart, 1875. Compiled (inter-alia) from the Government Archives (17 large volumes in MS. at Hobart) which include G. A. Robinson's despatches. And also from the recollec­tions of McKay and others whom Calder personally interviewed. - Some Account of the Wars of Extirpation, and Habits of the Native Tribes of Tasmania. Journal Anthropological Institute, 1874 III. pp. 7-28. A different account from the foregoing. - Boat Expeditions round Tasmania, 1815-16 and 1824. Papers of Legislative Council of Tasmania. Hobart, 1881. Contains: First Discovery of Port Davey and Macquarie Harbour by Capt. Jas. Kelly; and J. Hobbs' Boat Voyage round Tasmania, in 1824. - Language of the Aborigines of Tasmania. Papers and Proceedings Royal Society of Tasmania for 1876 (1877). pp. 7 and 72. Shillinglaw, J. J.: Historical Records of Port Phillip. 8vo. pp. 142. Melbourne, 1879. Contains Journal of the Rev. Robert Knopwood, 24th April, 1803 to 31st December, 1804. Knopwood was the first Chaplain of the Settlement at Hobart. Also in Colonies and Slaves (1831). Walker, Geo. Washington:The Life and Labours of G. W. Walker, edited by Jas. Backhouse and Chas. Tylor. 8vo. pp, xii. and 556. London, 1862. - Journal-in MS. 1832-1840 v. Walker J. B.
Jeffreys, Ch. Lieut. : V. D. Land. Geographical and Descriptive Delinea­tions of the Island of V. D. Land. 8vo. pp. 168. London, 1820. Meredith, Charles: Verbal Remarks on the Tasmanian Aborigines, Papers and Proceedings Royal Society of Tasmania for 1873 (1874). Davies, R. H.: On the Aborigines of V. D. Land., Tasmanian Journal of Science. II. pp. 409-420. Launceston and London, 1846. Lloyd, George Thomas: Thirty-Three Years in Tasmania and Victoria, being the actual experience of the author, interspersed with historic jottings. 8vo. London, 1862.